Who doesn’t like exploring a new lake? Well on a hot Sunday that was the plan. Crappie were the target and outside of that, we had no idea what the lake would fish like. I met my buddy Andy at sunrise and we launched the boat shortly after. We started off scanning the bottom with the side imaging. It is a big lake so exploring seemed like the best idea. We located several sunken trees that were completely vacant of fish. Then we checked out a rocky shoreline thinking that a “bass” pattern might work. Nope. Just rockbass and lots of them! As we worked off the rocky shoreline, a warden approached us. We had a short chat and he told us that they were there but not many people catch them on purpose. Lakes like this can be great because you will have them to yourself but at the same time locating and staying on them year around is a big chore. We fished just about every type of habit the lake had to offer and we covered about a third of the lake with side imaging. At the end of the day we had nothing great to show for other than checking of a new species on the bucket list. 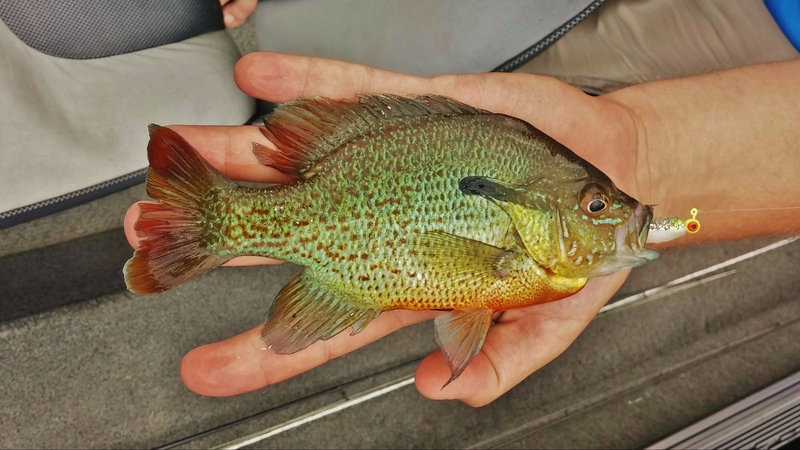 Redbreast sunfish. We caught a lot of them. While we didn’t complete out goal, we marked some weedbeds on our Navionics for a potential winter trip.